We’ll give you a moment to visit Sterling’s PeekYou profile and get up to date with that, but the gist is that Don said some fabulously idiotic and ignorant things and they have come back to haunt him. In fact, Adam Silver, the NBA commissioner, has banned Sterling from the league for life, and fined him $2.5 million. Additionally, the league is trying to compel, or even force, Sterling to sell the team. 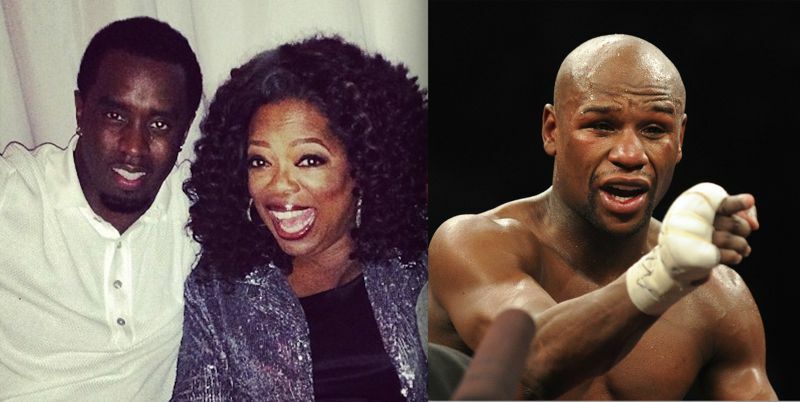 In the midst of all of this brouhaha, a number of celebrities have either actively stepped forward, or had their names bandied about, as potential owners, or part-owners, of the franchise; such as undefeated boxing champ Floyd Mayweather, Jr. (who at one time apparently had $123 million in his checking account: PeekYou profile here), Queen of the Universe Oprah Winfrey (PeekYou profile here), and Sean “P. Diddy/Puff Daddy” Combs (PeekYou profile here). Oprah threw her hat into the ring on Wendesday, as part of a deal that would find her sharing the team with fellow gazillionaires, Larry Ellison (of Oracle), and David Geffen (of DreamWorks, et al). Sports Illustrated writes of it all here. Twitter is ablaze with jokes regarding the awesome giveaways that would be inevitable at games should Ms. Winfrey become the team’s owner (in keeping with the sort of “everyone in the studio audience has just won a Buick” type deals on her TV show), which is a shame as we were going to make such a joke ourselves. But, you can follow what the Web has to say about all of the names referenced above, complete with original jokes — both in regards to this story and beyond — by visiting their PeekYou profiles.